A nice twist to polenta! Lightly grease a 9"x11" high-rimmed dish with PAM. In a large saucepan, bring milk, rosemary and salt to a boil over medium-high heat, watching carefully that it doesn't boil over. Add polenta in a slow, steady stream, whisking constantly. Reduce heat to medium-low and cook about 20 minutes, stirring frequently with a wooden spoon. Remove from heat and stir in 1/3 cup olive oil and parmesan. Pour polenta into greased baking dish, cover with plastic wrap and chill in the refrigerator for 1 hour. In a large sized skillet (preferably non-stick), heat 3-4 tbsp olive oil over high heat, until almost smoking, coating skillet evenly and completely. Make sure the pan is hot enough or the polenta will stick. 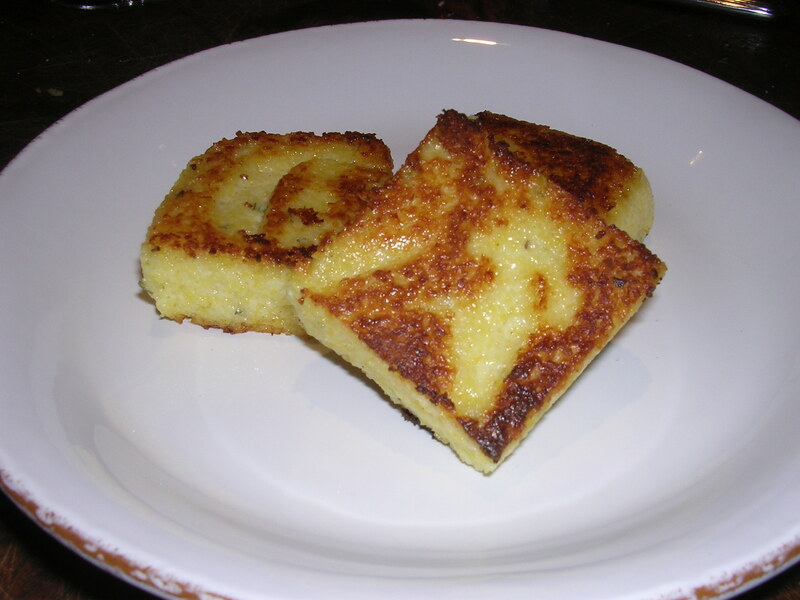 Remove the polenta from the refrigerator and cut into squares with a sharp knife. Carefully transfer pieces to skillet. Fry the polenta in batches, about 4-6 pieces at a time (do not overcrowd), for 5-6 uninterrupted minutes per side. Drain on paper towels. Cover with foil while frying the remaining pieces. Your first batch may not turn out as nicely as the remaining batches since the oil may not be hot enough etc. Replenish oil after each batch.